Despite every attempt to be on hiatus from any cats coming in, we have such a wide network of caretakers, cover such a large area and friendlies do stupid things and therefore can be at risk - Wednesday night at 8:45pm a friendly cat arrived at my garage that we had been trying for several days. Thru texts, neuter arrangements were made for the next day. Debbie picked him up and Linda & Mark brought him back. 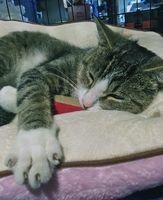 He is a friendly male, brown tabby/white. When I transferred him Thursday morning into a carrier, all he could do was tremble. When he came back in the PM, he still trembled but the happy paws were starting. He loves tummy rubs and now, Saturday, he is relaxing, laying all splayed out and talking. 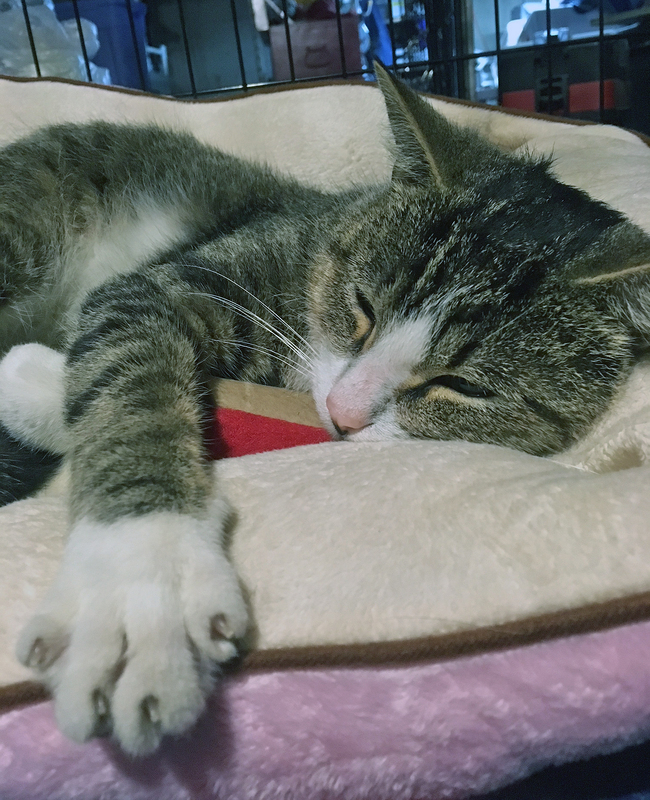 We haven't kept track of just how many cats have turned friendly, come to us friendly - its a movable number anyway as evidenced by a cat that I picked up from Animal Control yesterday. Spayed two years ago, she moved 2 1/2 miles away and now is as sweet as can be - the person who found her had to go out of town = turning her into Animal Control. He would love to adopt her when he gets back. As I've said before, we fill a niche for these cats that no one else can - thank you for your help! With the neutering of Sterling (who needs a foster! ), we have neutered 37 for the month of October, 710 for 2017 and 10,155 since we began in 2007. Hope to see you all at the 10K1K10Yr Celebration!